The Pasterfield Sports Complex spreads across 8 hectares and also boasts cricket practice nets, netball courts, a 1km shared pathway loop, outdoor fitness equipment, a dedicated parkour area and a giant playground, with separate play areas for younger and older children. It's also home to the Hunter Region’s tallest climbing net. Mayor of Lake Macquarie, Cr Kay Fraser, said that "[Cameron Park] is one of the region’s fastest growing suburbs, and it is also home to one of our City’s youngest populations. Census data shows Cameron Park recorded 54 per cent growth in the five years to 2016, while its median age is just 32 – 10 years younger than the Lake Macquarie median. More than 25 per cent of people living in the suburb are aged 14 and under. Construction on Pasterfield Sports Complex began in 2016, with work funded wholly by local development contributions. Acting Manager Community Planning Andrew Bryant says the complex demonstrates the kind of large-scale community improvements made possible under the local development contributions program. Pasterfield’s sports ground is capable of hosting full-sized AFL and cricket matches, or twin rugby league, rugby union or soccer fixtures. The site will be the new home ground of the Cardiff Hawks AFL Club and the Cardiff-Boolaroo District Cricket Club. The site is named after Geoff Pasterfield, Lake Macquarie’s first Mayor following its official declaration as a city in 1984. Mr Pasterfield died in 2005, but his daughter, Annette, said her father always pushed for the provision of community sports and recreation facilities. “It means so much to know his name won’t be forgotten,” Mrs Pasterfield said. Mr Bryant said the 960sq metre playground was a one-of-a-kind for Lake Macquarie, with 68 separate pieces of equipment and an imposing 6.5m-tall climbing net as its centrepiece. 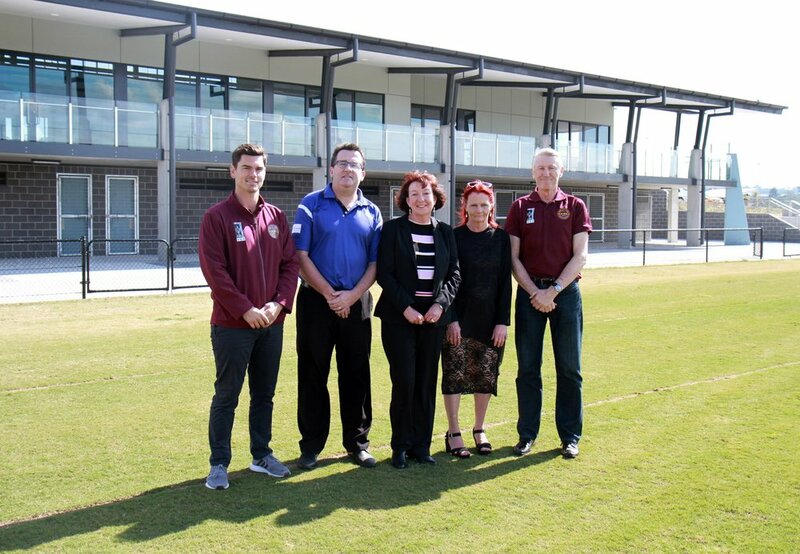 Pasterfield’s main clubhouse and upstairs community centre, with a function room, kiosk, change rooms and conference rooms, is expected to open next month in time for the summer sports season, together with a revamped BMX track at the southern end of the site. Visit the new complex in Cameron Park to see for yourself!